With more and more positive facelift experiences seen by the general public every year, society has become more open to the idea of facial rejuvenation restore and revitalize the face. With the advent of TV reality show such as botched and Internet sites such as real self.com, people are more educated than ever about facial plastic surgery procedures. Even with all of this new information and reputable sources, there are multiple misconceptions and myths regarding a facelift. So, let’s debunk them here. Let’s separate fact from fiction and get down the basics of what you need to know when considering a facelift. 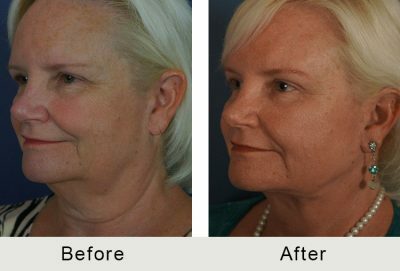 A facelift, also known as a traditional rhytidectomy, is a surgical procedure that removes excess fat in the neck, tightens the underlying muscles, lifts the cheeks, and removes excess sagging skin. This leads to the revitalization of the facial structure and brings back the original balance and proportions to the face. A rhytidectomy is performed by making small incisions beneath the chin, the temple, the hairline, and within the creases of the ear. Once the tissue is secured in each of these places, the excess skin is removed. Can Plastic Surgery Disfigure You? Yes, in some rare cases, plastic surgery can lead to disfigurement. However, this is overwhelmingly rare and is likely secondary to a multitude of mistakes. This can be caused by patients undergoing over aggressive surgical procedures or multiple/repetitive surgical procedures. If a patient chooses a surgeon that has documented safe practices, natural appearing results, and has a good reputation, their chances of having a wonderful and natural-looking facelift are overwhelmingly high. An ethical facial plastic surgeon will not perform a cosmetic surgery on a patient who is not fit for the procedure, mentally or physically. I have all of my patients undergoing a facelift procedure have an examination by the primary care doctor to ensure they are in excellent health. As a facial plastic surgeon, it is inevitable that I will have patients come to the office who are not mentally stable for surgery. Generally speaking, I am able to identify these patients before surgery and let them know they are not appropriate surgical candidates at this time. Most facial plastic surgeons will inadvertently operate on a patient who is not mentally stable. I take great pride in trying to ensure all of my patients are excellent surgical candidates for a facelift. The cost of a facelift varies depending upon the practice and the patient. The physician will examine a patient during his or her initial consultation to determine whether or not a patient is a viable candidate and to discuss exactly what procedure is needed. A facelift is not usually covered by insurance because it is considered an elective procedure and fees vary. While there are always extenuating circumstances that may be considered, patients should be prepared to pay out of pocket. Many people are surprised to learn that there is such a thing as a non-surgical facelift. Known as the “liquid facelift,” the non-surgical procedure is performed using a combination of lasers, skin care treatments, dermal fillers and neuromodulators. During the non-surgical facelift the face can be re-balanced and proportioned, fine lines and wrinkles improved, angulation and definition created, and improvements in the radiance of the skin. This can have a great improvement in the patient’s facial aesthetic. A liquid facelift is a great option for patients with early aging or is not interested in surgical procedures. A bandage will be applied over the place of incision following the facelift, but it can be removed for short periods of time. Bruising and swelling are very common and may last for up to two weeks. A follow-up visit is required one week after facelift surgery to remove the sutures and assess the healing process. Exercise should be avoided for at least two weeks, and sauna and steam baths should be avoided for at least two months after a facelift. Patients should be given more detailed instructions from their doctor post-surgery. When choosing a physician to perform your procedure, patients should do their research. Sometimes, patients want to see a doctor that is cheaper but they must remember that you only get one face, and if someone is offering services that are cheaper than all the rest, there is probably a reason why. Prospective facelift patients should use doctor-rating sites such as RealSelf, Healthgrades, and Vitals to learn more about the physician they are considering. On these sites, they can learn more about the doctor’s credentials, background, experience, and read feedback from previous patients. It is best to find someone that is an expert in the field of facial plastic surgery, instead of general plastic surgery when looking for someone to perform a facelift. Facial plastic surgeons focus solely on face and neck procedures. It is best to find someone who is an expert in operating on the specific part of the body the patient wants to be altered, in order to ensure that they are receiving the best care possible. Dr. Jonathan Kulbersh provides effective and individually-tailored facelifts that utilize his years of experience in the field and in-depth training as a double board-certified facial plastic surgeon. If you would like to learn more about facelift procedures, get in touch with us today to schedule a consultation.